Langu is a better way to learn and teach languages. There are so many great teachers out there, but students frequently struggle to find them. Langu connects eager language students with top independent language teachers from around the world. And we provide a sophisticated in-browser virtual classroom and a safe, effective payment system. Is Langu the right solution for me? Langu is for you if you’re looking for a high quality private language tutor who will adjust the learning plan to your individual needs, if you’d like to have a flexible schedule, and if you want to break the language barrier and take your language to the next level faster. How do Langu language lessons work? First, you’ll book and pay for your lesson at least 24 hours in advance – this gives the teacher plenty of time to prepare. When the time comes, you and your teacher will enter the virtual classroom, where you’ll connect via an audio/video link. It works just like Skype lessons, but with a better way to share content and work on writing tasks. During the lesson, you’ll talk to your teacher and complete various learning exercises. When it’s all done, you’ll rate your teacher and be able to go back and review what you’ve written on your virtual whiteboard. What languages can I learn on Langu? We’re constantly adding more languages. For now, you can find teachers who teach English, Spanish, French, German, Italian, Polish, Russian, and Mandarin Chinese. If we don’t offer a language you want to learn, please let us know! Email support@heylangu.com. It’s easy - just go to your teacher’s profile and choose a time from the calendar. You can purchase one lesson at a time, or purchase 5 or 10 lesson in advance, usually at a discount. You don’t need to schedule all of your lessons at the moment of purchase - you can schedule them later. Can I reschedule/cancel a lesson? Yes, you can unschedule your lesson up to 24 hours before the lesson time. Are Langu lessons private or in group? All Langu lessons are all private (one-to-one). Is it possible to teach two people at once? Yes, but the two of you need to be in front of the same computer. You should also discuss this with your teacher during your trial lesson. Will I be provided with learning materials? Our teachers use their own materials, which they normally share with students. You will discuss materials during your first lessons. What happens if I am not satisfied with the quality of my lesson? Langu’s teachers come from all walks of life. They are top teachers united only by passion and talent for teaching. They have a wide range of expertise, from law to IELTS to politics to medieval literature. We believe qualifications and experience are important, but we also look for a mix of smarts, passion for teaching, and specialised expertise. How can I choose the best teacher for me? Think about your learning goals and search through teacher profiles. If you’re not sure, you can message the teacher before a trial. We know all our teachers quite well, so if you’d like a personalised recommendation, email support@heylangu.com with a short description of yourself and your learning goals and we’ll make the best recommendation we can for you. What qualifications do Langu teachers have? Most teachers have professional teaching qualifications, such as CELTA, DELTA, TEFL or a university degree in teaching. Some others have extraordinary experience. What methodology do Langu teachers use? They use different methods as everyone has different needs. There’s no one-size-fits-all approach. Most teachers emphasise spoken communication as an important step to breaking the language barrier. Do I need to learn from a native speaker? Not necessarily. Some of our language teachers are native speakers of that language, but many are not. As language learners and teachers ourselves, we’ve found that people who have gone through the process of learning a second language are in a great position to teach it – because they know from experience what you’re likely to find difficult. Of course, we also have amazing native-speaking teachers. When choosing a teacher, we recommend you focus primarily on the teacher’s experience, languages spoken, interests, personality, price and availability. How can I get in contact with a teacher? If you’d like to get in touch before booking a trial lesson, you can visit the teacher’s profile and click the button that says “Send me a message”. The teacher has no availability on their calendar. What do I do? You can always send the teacher a message asking them to update their calendar or see if they could be available at a particular time that suits you best. How much do Langu lessons cost? Teachers choose for themselves how much to charge, and they base their decisions on various criteria, such as how much experience they have, what qualifications they hold, and any other relevant experience and expertise they bring to their lessons. Hourly rates generally start from about €10/hr. Langu makes money by charging teachers a 15% commission on their lesson fees. There are no extra fees for students. Most teachers offer free trials; others offer the first introductory lesson at a discount. You can book the trial directly on your teacher’s profile page. During the trial lesson, which can last up to 30 minutes, you’ll discuss your learning needs while you get a sense of the teacher’s style of teaching. Lessons are paid upon booking. You can purchase a single lesson (30, 60, or 90 minutes in length) or purchase a package of 5 or 10 lessons. You can pay for lessons directly on the teacher’s profile page, using a debit or credit card, VISA or Master Card. You can pay in one of the following currencies, without any additional currency conversion fees: US Dollar (USD), British Pound (GBP), Euro (EUR), or Polish Złoty (PLN). I want to book more lessons - are there any discounts? Yes - normally the package prices are lower when you purchase 5 or 10 lesson at a time. You can pay for your lessons in Euro (EUR), British Pound (GBP), US Dollar (USD) or Polish Złoty (PLN) without incurring any additional cost. If you need to pay in a different currency, you can select one of these four, and your bank will convert to your own currency (however, you may be subject to exchange fees). Can you provide an bill? Certainly! You can customise the information you would like to appear there (e.g. your name, a company name, registration number, address, etc.). To do so, go to your “My Settings” page and click on “Receipt Information”. Enter purchaser details and click Save Changes. Then, click on your Receipts link at the top of the page. 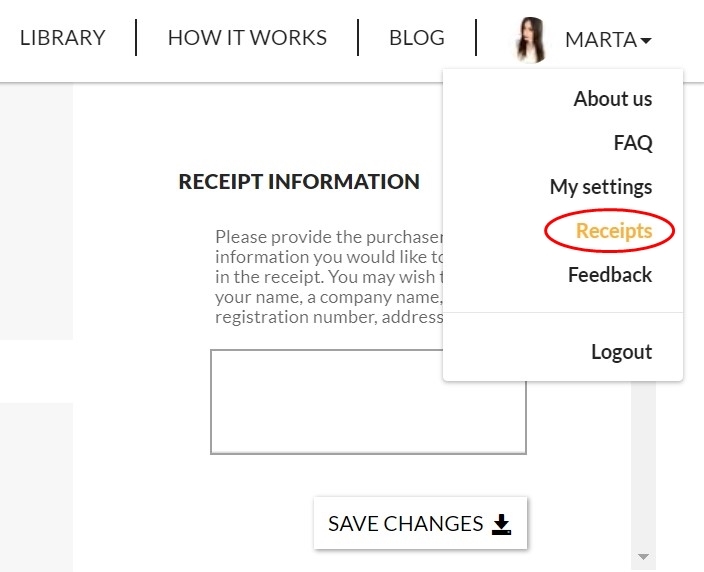 You will be able to download a receipt for every purchase you've made. What happens with my money after I have booked a lesson? When you purchase the lesson, the funds go into a central account managed by Langu. After the lesson is finished and the lesson is given a rating of 3 or more stars, the funds are transferred automatically to the teacher. What should I do if my card transaction fails? You may need to contact your bank instruct them to approve the charge. If you have questions or issues, email us at support@heylangu.com and we’ll do the best we can to help. You can request a refund at any time up to 11 months after the date of purchase. Refunds will usually be subject to a 15% processing fee and a 15% fee for the teacher. Will my Langu lessons ever expire? Lessons purchased on Langu are valid for 12 months from the date of purchase, after which they will expire. Refunds can be requested up to 11 months after purchase. What are the technical requirements I need to use Langu? Our virtual classroom only works on computers, not on mobile. You’ll need an internet connection of at least 1mbps, and our platform works on Chrome and Firefox (sorry Safari fans!). We also strongly recommend that both student and teacher use headphones to minimise echoes, and avoid noisy locations and unreliable wifi connections. We recommend that you use this pre-call test to check your setup before your first lesson: tokbox.com/developer/tools/precall/. Do I need Skype to use Langu? No! Skype has been used for language lessons for too long. Language learning requires more visual and text-based resources than Skype can provide. That’s why we’ve developed our own virtual classroom. You can sign up with either Google or your non-Google e-mail address. You don't need a Google account anymore to use Langu - our platform works great in both cases! I can’t enter the classroom. What should I do? The “Go to class” button will turn orange right after your teacher enters the classroom first. What should I do if there is a technical difficulty I’m unable to solve? Just send us an email: support@heylangu.com. Try to describe exactly what has happened in as much detail as possible, and tell us what we can do to make it right. Generally, most problems can be solved by: switching from Chrome to Firefox or vice versa; logging out and logging back in; using an Incognito window (to block browser add-ons that sometimes get in the way), or restarting your computer. Langu was founded as better way to teach and learn languages. There are so many great teachers out there, but students struggle to find them. Langu connects eager language students with top independent language teachers not just from the student’s hometown, but from around the world. And we provide a sophisticated in-browser virtual classroom and a safe, effective payment system. If you’re a stellar teacher of any language, please apply here: http://goo.gl/forms/pGfuJ6RrFvwnmv3F2. Please give us as much info as possible. You’ll need to show evidence of qualifications and/or teaching experience. We’re building up as diverse a group of top teachers as possible on Langu. Qualifications and experience are important, but we also look for a mix of smarts, passion for teaching, specialised expertise. Students come to Langu from many different backgrounds. We classify their goals into three categories: Life (for general learning and travel), Career (for work), and Education (for getting ready for exams and higher education). Most of our students are currently from Europe. Langu’s teachers come from all walks of life. They are top teachers united only by passion and talent for teaching. They have many ranges of expertise, from nursing to law to TOEFL to medieval literature. All students and teachers are different. Emphasize what makes you unique – your teaching and professional background, interests, the places you’ve lived in and travelled to, the kinds of lessons you like to conduct. Don’t try to be everything to everyone. If you’re approved to be a teacher, there is no charge to set up your teacher profile. You’ll set your own hourly rate, and once you start teaching, Langu will charge a 15% commission. Unlike some other providers, this covers ALL fees and helps us keep our pricing as simple as possible: there are no extra pay-out fees (subject to reasonable minimum balances) or pay-in fees for students. We hope you'll agree this is fair: it covers the expenses of marketing and finding students, providing customer service, bandwidth, and arranging secure, often complex international payments. You can set up your pricing in EUR, GBP, USD or PLN. Students will pay your lesson price when they book the lesson, and the funds will transfer automatically into your e-wallet when the lesson has concluded and the student gives you a positive rating. You can then transfer funds from your e-wallet to your bank account. How long does it take for the transfer to take? What do I need in order to teach? A computer (not a mobile device) with Chrome, Firefox or Opera and a solid internet connection. A Google account. This is because some of the virtual classroom technology uses your Google Drive. Headphones with a microphone. This will ensure a clear audio signal for your students. The internal mic on your computer picks up too much noise and echo. Some digital learning materials. You'll be able to store these in your teacher dashboard, and share them with students during lessons. A student will book and pay for your lesson at least 24 hours in advance – this gives you plenty of time to prepare. When the time comes, you and your student will enter your virtual classroom from your “My Lessons” page, where you’ll connect via audio/video link. During the lesson, you’ll talk to your student and complete various learning exercises using the virtual whiteboard and resources you’ve uploaded. When it’s all done, your student will retain access to the virtual whiteboard and resources so they can go back and review. How do I share learning resources with my student? Before your lesson, click on “Library” and upload as many files as you’d like. Then, under “My lessons”, click “Add resources” to an individual lesson. Then select the files from your Library you’d like to share. There you can also add objectives to keep track of progress during the lesson. The resources and objectives will be available in the classroom when the lesson begins. If you or your student experience technical difficulties during the lesson, there are a few troubleshooting techniques that usually fix things: - If you and/or your student can’t see or hear each other: restart your browsers. Remember, you can always leave the classroom and return via My Lessons. (Only click “Finish class” when the class is really finished.) If things go terribly wrong, as a teacher you can always click “reschedule” on the My Lessons tab, which allows the student to reschedule the lesson for another time at no cost. Finally, please email support@heylangu.com to report any issues that arise. Langu helps you find a great language teacher no matter where you are. You can find answers to common questions here. If you need any further help, feel free to get in touch!